جداسازی کلاله از بقیه اجزای گل یکی از مهم‌ترین چالش‌ها در فرآیند تولید زعفران تجاری می‌باشد. مراحل جداسازی ماشینی کلاله از یک توده گل زعفران شامل: الف) تک سازی گل‌ها، ب) ردیف‌کردن گل‌ها، ج) برش دم (قسمت اضافی) گل‌ها و د) جداکردن گلبرگ و پرچم می‌باشد. درواقع بدون تک­سازی و جدا کردن تک‌تک گل‌ها از هم، جداسازی ماشینی کلاله نمی‌تواند انجام شود. به دلیل اهمیت این مرحله از جداسازی گل زعفران در این تحقیق یک دستگاه دست‌ساز آزمایشی برای تنک‌سازی و ردیف کردن گل زعفران ساخته شد، به‌طوری که قابلیت کار و نصب با دستگاه‌های برش و جداسازی کلاله از گل و تبدیل به مقیاس صنعتی را نیز داشته باشد. برای این منظور از یک استوانه بردارنده برای تک‌سازی گل‌ها و از یک سطح شیب‌دار و نوار نقاله برای ردیف کردن گل‌های زعفران استفاده شد. دستگاه ساخته شده ازنقطه‌نظر بازده تک سازی و تلفات مورد ارزیابی قرار گرفت. به این‌ منظور از سه نوع گل زعفران (غنچه، باز دم­کوتاه و دم­بلند)، سه سرعت دورانی استوانه بردارنده (6، 12 و 5/21 دور بر دقیقه)، سه میزان مکش (30، 70 و 100 میلی‌متر جیوه) و چهار قطر داخلی سوراخ انگشتی‌های مکشی (2 تا 5 میلی‌متر) با سه تکرار استفاده گردید. نتایج تحقیق نشان داد که به‌طورکلی، بیش‌ترین بازده تک‌سازی برای گل‌های زعفران باز دم­کوتاه برابر 75 درصد، در قطر سوراخ داخلی انگشتی‌های مکشی 5 میلی‌متر و میزان مکش 100 میلی‌متر جیوه در سرعت دورانی 6 دور بر دقیقه به‌دست می‌آید. برای ارزیابی عملکرد ردیف‌کردن گل زعفران، تعداد 100 عدد گل زعفران با طول 5 سانتی‌متر انتخاب شدند و در 5 تکرار آزمایش گردید که میانگین ردیف‌سازی با جهت صحیح گل‌ها برابر 84 درصد بدست آمد. Separation of stigma from petals is one of the required tasks in saffron production. The mechanical separation of saffron flowers may be performed through the following steps: I) singulation of the flowers ii) aligning the flowers iii) cutting the style (Konje) and iv) separating the stigma from the petals. Because of the importance of saffron flower separation, a prototype device was constructed in this project for singulating and aligning of saffron flowers, prior to the cutting operation. This device can also be installed to work with other cutting and separating equipment and produce on an industrial scale. A pickup vacuum cylinder was used for singulating the flowers and an inclined V-shaped surface was employed for aligning of saffron flowers. The constructed apparatus was evaluated from the standpoint of singling efficiency and losses. For this purpose, three types of saffron flowers (buds, open short tail and long tail), three rotational speeds of pickup cylinder (6, 12 and 21.5 rpm), three levels of suction (30, 70 and 100 mm Hg), and four different inner diameters of finger’s nozzle (2, 3, 4 and 5 mm) were used with three replications. The results of analysis on the constructed device showed that the highest efficiency (75%) is observed for short tailopen saffron flowers with 5 mm inner diameter of sucking nozzles, suction of 100 mm Hg and the rotational speed of 6 rpm. To evaluate the performance of flower aligning, 100 saffron flowers with an average length of 5 cm were selected and tested with 5 replications. The average aligning with the correct direction obtained was equal to 84%. Alishahi, A., and Shamsi, M. 2012. Saffron separation from other parts of the flowers in the wind tunnel and its assessment with fuzzy logic. Journal of Agricultural Machinery 2 (2): 120-126. (In Persian with English Summary). Bakhshi, H. 2015. Design, construction and evaluation of a row singulator for saffron flowers. Msc. dissertation, Faculty of Agriculture, Ferdowsi University of Mashhad, Iran. (In Persian with English Summary). Esfandiari, M., Sharini, M., Gholipour, A., and Rahmati, A. 2011. Category and qualitative separation flower using a appearance of the image features. In Second National Conference on Computer Engineering and Information Technology, Hamedan, Iran, 17 february, 2011. (In Persian). Graciaa, L., Perez-Vidalb, C., and Gracia-Lo´pezc, C. 2009. Automated cutting system to obtain the stigmas of the saffron flower. Biosystems Engineering 104 (4): 8-17. Mohaimani, S.M., and Abbasi, M. 2007. Construction separation of stigma saffron the mechanical method. ISME, Amirkabir University of Technology, Tehran, Iran, 15-17 may, 2007. (In Persian). Paschino, F., and Gambella, F. 2008. First contribute to the mechanization string of saffron flowers (Croccus Sativus L.). International Conference, Italy, 15-17 September, 2008. Saeidirad, M.H., Zaryfneshat, S., Nia, A.M., and Nazarzadeh, S. 2013. Investigation and research in the development of mechanization and to provide a best practice and the pattern of mechanized operations in the saffron harvest. Engineering Researches Center of Agriculture and Natural Resources of Khorasan Razavi. (In Persian). Shamsi, M., Mazloomzadeh, M., Asghari, J., and Mohamadian, A. 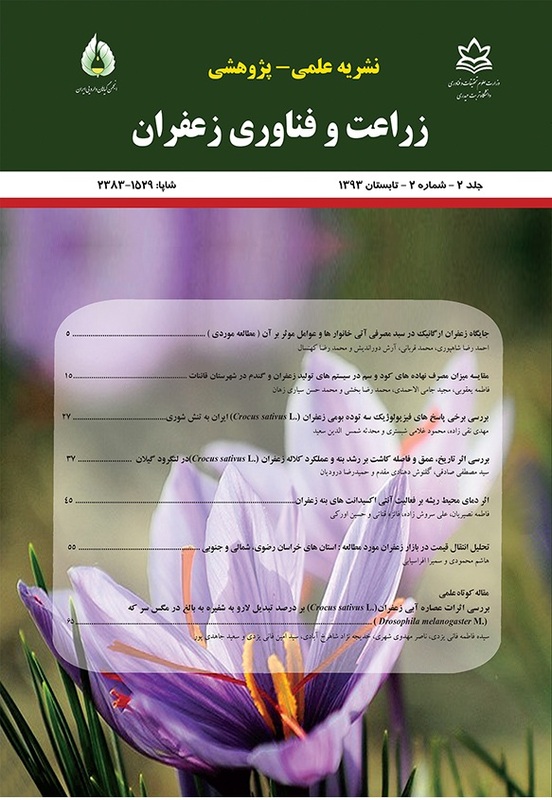 2012. Review and assess the possibility of separating blow stigma from saffron flower. In Seventh National Congress of Agricultural Machinery Engineering and Mechanization, shiraz, Iran, 4-6 September, 2011. (In Persian). Valeghozhdi, H., Hassan Beygi Bidgoli, H.B., Saeidirad, M.H., and Kianmehr, M.H. 2010. Shear strength of stem and picking force for saffron flowers. Agricultural Engineering Research, 11 (3): 41-54. (In Persian with English Summary).